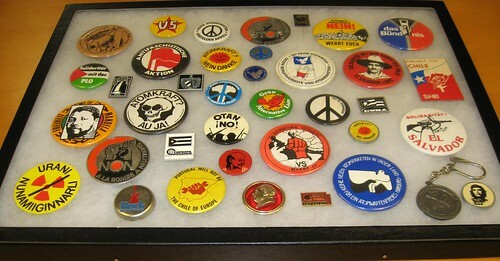 Notes: The buttons and key chain displayed here feature internationalist progressive struggles; regions included are : China, Cuba, Denmark, France, West and East Germany, Greenland, Iran, Spain, Portugal, and the Union of Soviet Socialist Republics. The buttons express sentiments of environmentalism, anti-nuclear protests, international solidarity, and feature numerous peace symbols. In addition to language, there are many stylistic differences from the buttons made in the United States. Preferred Citation: Ken Lawrence collection, 1940-2010, HCLA 6312, Special Collections Library, University Libraries, Pennsylvania State University. Repository: Penn State Special Collections, University Park, PA, USA.